The final week of the NFL’s regular season will be played this weekend, and one of the matchups is between 2 old rivals, the Pittsburgh Steelers and Cleveland Browns. The Steelers are headed to the playoffs with a first round bye secured, while the Browns are winless and are the league’s ultimate bottom-feeders, having won only one game in the past two seasons. Our final Throwback Thursday feature for 2017 harkens back to October 10, 1964 to a meeting between these 2 franchises back when their fortunes were reversed. The Browns were a powerhouse in the league and were on their way to claiming the NFL Championship that season, while the Steelers were half a decade away from hiring Chuck Noll as head coach and turning the team’s fortunes around. Pittsburgh was a rough team that played hard-nosed, and sometimes dirty, defense, while routinely losing games. In what was an annual tradition at that time, the game was played on a Saturday night rather than the usual Sunday afternoon, and on this night, the Steelers pulled off a Saturday Night Surprise, as they dominated the Browns on their own home field, the old Cleveland Municipal Stadium. Using a power running game that featured future Hall of Fame fullback John Henry Johnson, Pittsburgh threw the ball only 11 times all night, and wound up gaining 354 yards on the ground on 64 attempts. Johnson carried 30 times for an even 200 yards and scored all 3 of his team’s touchdowns, while Clarence Peaks added another 96 yards on 21 tries. 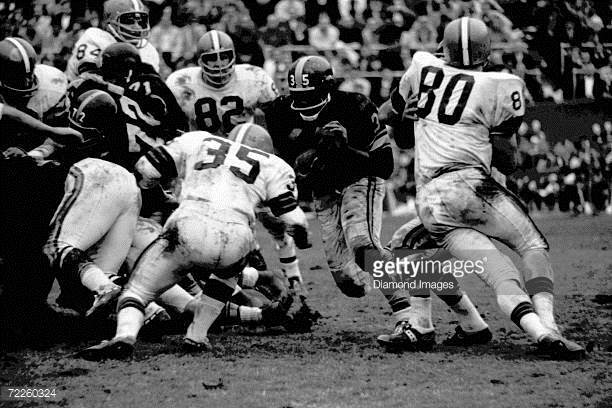 Meanwhile, the rugged Steeler defense neutralized Cleveland’s star fullback, Jim Brown, holding him to only 59 yards for the night. They also harassed quarterback Frank Ryan, sacking him 4 times (although sacks were not an official statistic at the time). In all, the Steelers outgained the Browns in the game, 477 total yards to 217 in securing a 23-7 victory. It was Cleveland’s first loss of the year, dropping their record to 3-1-1, while the win lifted Pittsburgh to 3-2 and within a half game of overtaking the Browns. Pittsburgh reverted to their losing ways, however, finishing the season at 5-9 while the Browns, as stated earlier, went on to capture the league championship. Coach Blanton Collier’s Browns also got revenge on the Steelers later that year, going into Pitt Stadium and pulling out a 30-17 win in November.